Make a statement with the Gaggia Espresso Color! This semi-automatic espresso machine is housed in bright red ABS plastic for a stunning, exceptional design. Using a stainless steel boiler, it brews pods or ground coffee and includes filter baskets for brewing single shot, double shot, or pods. The group head and filter holder are made of heat-retaining chrome plated brass for long-lasting heat stability, and you can pre-heat your cups on the passively heated cup warmer. Donât forget about those cappuccinos and lattes â a Pannarello frothing wand attachment makes it easy to foam and steam milk without a fuss. 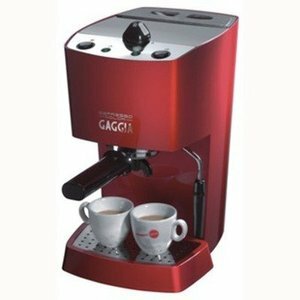 Great for espresso lovers and home baristas at any stage of experience, the Gaggia Espresso Color comes ready to please.